This makes about seven ramekins. My ramekins are 8oz cups. You will also need a package of peanut butter cups. Cut them up to desired sizes. As for the bottom of your cheesecake…you can use crushed graham crackers (basic recipe is crushing a cup worth of graham crackers and mixing that with 3 tablespoons of melted butter). You also can omit the bottom crust all together. Put 2 tablespoons of the graham cracker mix at the bottom of a ramekin. 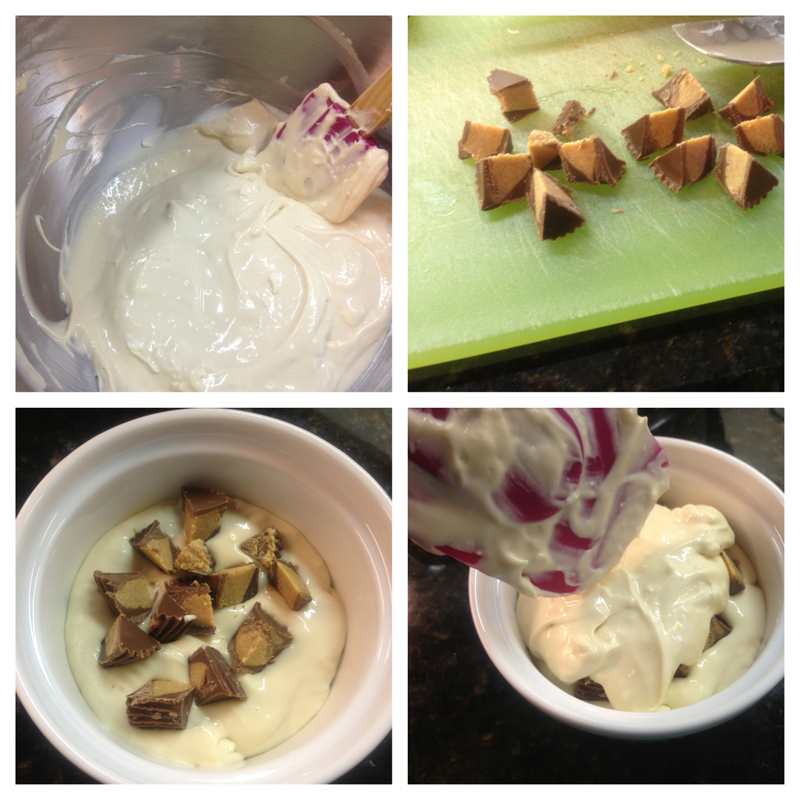 Fill cup with about a 1/4 cup of cheesecake mixture. Add cut up peanut butter cups. Fill cup with another 1/4 scoop of cheesecake mixture. If you have left over mixture, simply add a spoonful to each cup! I like to put a pan of water at the bottom of the oven. I believe the extra moist air keeps the cheesecake from cracking. If you omit this step…whats a few cracks anyway? You will be covering it with whipped cream. No one will know! Bake at 325 degrees for about 25 minutes. Let it cool. Top with freshly whipped cream! For the center try: Snickers, Heath Bar, Butterfingers, or feeling fruity? Try a tablespoon or two of really good jam, chopped up mango, or peaches.